With only weeks to go before the roll out of the Nevada health care exchange, developers knew they were in trouble. In August 2013 the governor was made aware of serious “readiness concerns.” In September, with the first TV commercials already on the air, developers and end users had yet to begin final testing of the site. The implementation of the site was significantly behind schedule, yet surprisingly representatives from the federal government told Nevada officials in early September that their state of readiness was about average. In July 2012 the state of Nevada selected Xerox as the “Business Operations Solution (BOS) vendor” to design and build the Silver State Health Insurance Exchange. The contract was set to extend until December 2016 and was not to exceed $72 million dollars. The launch date of the new exchange was set by the federal government as October 1, 2013. That meant Xerox had about 15 months to get the system up and running. That may be so but the reference to “high risk” in the Director’s report is followed immediately by a link back to the IV&V report, i.e. the one which indicated twice that the go live date was “in jeopardy.” The possibility of failure in this case was not implied, it was stated outright. So apparently “average status of implementation” and “high risk overall” were synonymous as of mid-September. Looking around at the general failure of the exchanges this may in fact be true. The Nevada exchange, like the federal exchange, has been up and down during its first week as attempts have been made to patch software bugs which were not caught or not addressed prior to the go live date. One of the last documents published prior to the go live date was a status report on various elements of the exchange implementation. This report, received by the state on September 16th, indicates that serious problems with testing and system integration remained. The status update uses a color coding system–red, yellow, green–to indicate the status of various elements of the project. Of the seven elements of the project being tracked, four of them were marked in red indicating a severe risk to the success of the project. For instance, under the heading “Infrastructure” the overall schedule status is red. From the date the state received this report there were only 10 business days left before the site went public. The next subsections of the status report deals with “portal configuration.” It states “The teams are working to meet the code freeze date to allow UAT to commence the week of 09/20.” UAT stands for user access testing, which is the final stage of real world testing before the roll out of a new site. Code freeze refers to a break in the programming which allows features to be tested. What this indicates is that Xerox hoped final testing could begin six business days before launch. I asked Xerox if they had met their September 20th deadline for code freeze and whether this left enough time for final testing (UAT). Kevin Walsh replied by email “the actual date was 9/23. Extensive testing by the end user community was done prior to the code freeze, but that was done in test environments. The formal UAT was intended to make sure that the production environment reflected fixes to bugs that were identified in the test environments going back as far as early August.” So final testing had just five business days. As we’ll see in a moment, not all the bugs were successfully caught before the release date. 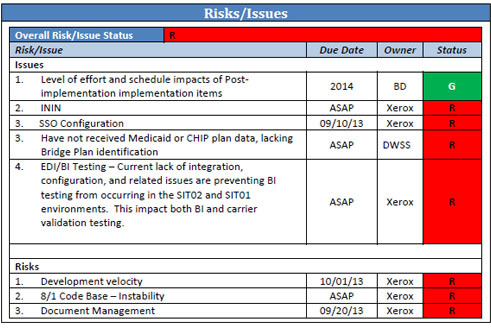 Again I turned to Kevin Walsh at Xerox who had this to say “The resource issue as of this 9/13 status report was immediately addressed and Data Warehouse (DW) testing to address 10/1 requirements was accomplished by month end. There will also need to be continued DW testing for changes made after 10/1.” So perhaps they were able to pull testing together in the remaining two weeks. But we know for certain that not every part of the exchange worked as originally intended on launch date. Apparently, the exchange’s director had given up on having a functional electronic enrollment system at launch. Because of the unresolved EDI 834 problems the current enrollment process for Nevada’s exchange is to print out completed applications and physically deliver them to the insurance carriers. Walsh explained “While enrollment transmission functionalities are being finalized, a paper-based process is getting all enrollment materials to the carriers in a secure and timely manner. We expect to have these functionalities in place in the coming weeks and to test well in advance of 12/15 to meet the needs of Nevadans buying insurance through the exchange.” December 15th is the final date on which someone can enroll online and be covered for January 1, 2014. But again, at least for the moment, the Nevada exchange is unable to exchange any enrollment records with insurance carriers except by paper. For a project of this magnitude, testing started very late- due to multiple issues. The testing process appears to have been slipping during the SIT (system integration test) which is indicative of major code issues (which can typically hide until you start to put the whole system together in the test environment). There are also indications of major software components not being completed in time for the SIT. This is a big red flag for a project that’s being rushed to meet an immovable deadline. As the saying goes: ‘Nine women can’t have a baby in one month’. The integration issues also suggest that the structural quality of the code was lacking any kind of oversight during the bulk of the actual software construction phase of the project. Interfaces seem to be a big issue identified PCG. Interfaces are the toughest part to work out and the software quality of those interfaces is the most typical source of ‘gotchas’ in late stages of projects. Not all of the problems with the Nevada exchange were caused by internal scheduling. The final September status report also notes “Have not received Medicaid or CHIP plan data, lacking Bridge Plan identification.” The “owner” of this action item was listed as DWSS, the abbreviation for the Nevada Division of Welfare and Supportive Services. September 13th seems like a very late date to be delivering plan data so I asked Xerox what caused the hold up. Kevin Walsh replied “the HHS data goes to the HIX system through DWSS, it is a complex flow. It’s not possible for us, as the end user, to determine where the delays might have been if there were any.” So it’s possible the delay was at the state level or it might have been a failure on the part of HHS. Can’t sign up if we can’t even apply…each day I get one step closer….today I finally got a verification code, but can’t get past the “accept terms” page. Needs to be operational!!! I have had to call multiple times since October 1, and I have yet to be able to access the website. The farthest I have gotten is to register. I have never been able to log in. I know there are glitches and it’s new… but this is so frustrating! I am getting terribly frustrated…I cannot connect to a live person on the phone not do you respond to my e-mails…I try to create an account…first I get error messages then I’m told my account is locked. Could you at least make some kind of news announcement at to when the health link really will be up and running. It is VERY DISCOURAGING to go to the site everyday and watch my computer try to connect to nothing. I have been trying since October 1st to shop for insurance, I try everyday and I still cannot get passed the security question it just erases my answer and goes no where. I am losing hope and dont know what else to do. Are people really getting though? Update: CJ Bawden, spokesman for the Nevada exchange, emailed to object to my statement that the documents used in this report were “taken down” (as I’d stated above). He writes, “The entire exchange.nv.gov site was down at various times this morning. This was an issue that affected many of the Nevada State Government Agencies.” So it appears the documents were not taken down they were just down. All of the documents are once again accessible. CJ adds that Nevada, by posting these documents online, has been more transparent in this process than other states.